The 2018 Munich Security Conference continued the trend of promoting a New Cold War while diplomats openly disparaged Russia and fretted over the Trump presidency, Gilbert Doctorow reports. The annual Munich Security Conference is to geopolitics what Davos is to global economics: a forum for public discussion of challenges and trends, as well as a venue for side meetings off the official schedule by Very Important People that are at times even more intriguing than the formal events. By the latter I have in mind, for example, the tête-à-tête behind closed doors between former Ukrainian Prime Minister Yulia Tymoshenko and the Russian ambassador to Germany that set tongues wagging back in Kiev and Moscow, even if it was passed up in the Euronews coverage. The very biggest names in global politics make their appearances at Munich and occasionally catch the imagination of all with substantive as opposed to merely clever remarks. No one familiar with the venue can forget Vladimir Putin’s speech there of February 2007. It set in motion the open challenge to US global mastery that has evolved into the deep cracks in the world order which were the main theme of Munich a year ago, and which presented themselves again for consideration in the latest, 2018 edition, which took place 16-18 February. Parsing an 88-page text like the Report might be a step too far. But a word about its style is in order since that takes us directly to analysis of its content. And while the texts in the Report allude to interviews in the press by former German Foreign Minister Walter Steinmeier, and a side column quotes from Russian Foreign Minister Sergei Lavrov’s speech to the Conference last year, there is more than a sprinkling of references to leading personalities in America’s Council on Foreign Relations, starting with its president, Richard Haass. And what is surely the most remarkable quote in the Report (see below) comes from Council member and long-time book reviewer for Foreign Affairs, Princeton University professor G. John Ikenberry. To cut to the quick, the American input to the agenda and posture of the Munich Security Conference is of decisive weight when you look at the recommended reading (“Food for Thought”) and special reports sections at the back. In the Acknowledgements section at the very end, we find the heavyweights RAND Corporation, North Atlantic Treaty Organization and NATO Strategic Communications Center of Excellence listed together with the lightweight but very voluble Freedom House. This Establishment is Atlanticist, a promoter of the liberal institutional order that it helped to create over the past 60 plus years in the knowledge that the biggest financial and political beneficiary of an order based on rules written in Washington has been the United States. To a man, they are anti-Trump. Indeed, the text of the Munich Report drips with anti-Trump innuendo and a good dose of despair over the ongoing triumph of the anti-Christ who is currently the U.S. President. Let us remember that over the course of his career Ikenberry has been a penetrating and at times courageous analyst. Back in 1992, he co-authored with Daniel Deudney a splendid article entitled “Who Won the Cold War” (Foreign Policy) explaining why it was a draw, ended by mutual agreement. He thereby went directly against the rising tide of neoconservatism and American hubris built on falsification of modern history. American Establishment biases, willful ignorance of realities and fake news are given free rein in the page of the 2018 Report devoted to Russia. Here we read about the Kremlin’s “disinformation campaign” during the French presidential election of 2017 and about the “efforts to influence the U.S. presidential election in 2016” that have “paid dividends.” Unproven allegations of meddling and illogical conclusions about dividends, considering the track record of the Trump administration in its first year in office: the dispatch of lethal military equipment to Ukraine that even Obama hesitated to approve, the extension of sanctions and a number of other measures raising the tensions with Russia in the Baltics and in Syria. Here we find the stubborn refusal to accept the true scale and breadth of Russia’s might. We are reminded that the country’s GDP is the size of Spain, a proposition that is distorted and misleading depending as it does on exchange rates rather than purchasing power parity. At last report, Spain was not supplying one-third of all the natural gas consumed in Europe; Russia was. At last report, Spain did not have a military budget that is second only to the United States; Russia has. Yet, the Munich Security Conference differs in an important way from the American establishment, which is today not very welcoming of “adversaries” or “competitors” who may conceptualize the world order in their own way. 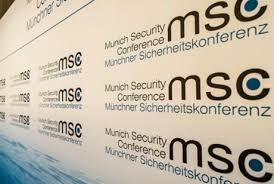 Whatever its home grounds philosophically, the Munich Security Conference does try to be inclusive and brings even troublemaker countries and personalities into the tent. Moreover, the Security Conference, like Davos, has substantial continuity in the attendees. You heard from the Iranian Foreign Minister last year, and you will hear from him again this year, and probably next year as well. This does not smooth out all the rough edges in these encounters, but it keeps them somewhat in check. One of the “regulars,” and perhaps the most remarkable performer at the 2018 Munich Security Conference was Russian Foreign Minister Sergei Lavrov. I call him remarkable because of his ability to rise above his detractors in the hall through superior command of the facts, wit and daring. At last year’s Munich Conference, a number of Lavrov’s pronouncements were met by derisive laughter from the Americans in the front rows, picked up by other Western diplomats and politicians. Yet, Lavrov took it in stride, remarking acidly that he had also found some statements by representatives of other countries to be laughable but had shown greater restraint than members of his audience. Lavrov’s speech itself was a masterpiece of argumentation against the exclusion of Russia from the common European home, the descent of a divisive “us/them” thinking in Western Europe to justify the New Cold War. He specifically called out for condemnation the ongoing rewriting of history in the Baltic States, in Poland, and in Ukraine that airbrushes Russia out of the victory over Nazi Germany, encourages destruction of monuments to Soviet liberators and makes heroes of home-grown fascist movements as in Ukraine. It bears mention that back home in Moscow, there are voices of strident nationalists like Vladimir Zhirinovsky who explain on national television day after day why it is time for Lavrov to go, because he is too soft, too easy going with the nation’s enemies in the West. However, the skill at debate, nerves of steel and icy reserve that Lavrov displayed in Munich show yet again that he is the right man in the right place to defend Putin’s Russia. The problem that comes out of the Report and the body language we saw in the conference proceedings is the following: whether the opposing sides of East and West were more or less restrained in their gestures and words, there lies on each side a poisonous contempt for the other that could lead to miscalculations and rash actions in the event of some incident, some mishap between our respective armed forces in any of the theaters where they are now operating in close proximity in support of opposing sides. Gilbert Doctorow is an independent political analyst based in Brussels. His latest book, Does the United States Have a Future?was published on 12 October 2017. Both paperback and e-book versions are available for purchase on www.amazon.com and all affiliated Amazon websites worldwide.